Did you ever order this item from EBAY and did it work? They are still on EBAY for $75 shipped. I'm having the same problem on my 02 Forester. I need a permanent fix and it seems like replacing everything with all new stuff might last the longest? OK, I tried this but I don't think I did it correctly. The middle bushings were shot so only replaced those. BTW, the tip about boiling them worked great. Didn't need to do any trimming. Also, I greased the ball joint that the bushing slides over. Anyways, I'm going to replace the far right and far left connecting bushing this week. Also, I didn't replace the worn out rubber washers. I'm going to get the grommets mentioned and use those. My main question - Do I need to grease the ball joint that the bushings ride on? If it doesn't work this time I"m just going to buy the complete replacement linkage assembly for $80. Don't know if anybody that originally posted here is still around or not but I'm going to update with my experience just for others who may find it helpful. After replacing some bushings to no avail I tried the grommet trick. Help a little bit but not enough. I ended up ordering the new linkage from EBAY for $73. I bolted right in and now everything is working GREAT! After seeing the new linkage I can see that all the rubber washers & plastic spacers were completely worn out on my old linkage. If you live near a auto parts store and hardware store you can search around for these parts and hope to get it right the first time. If not you keep adding washers or spacers. If you don't have much free time like me the just order the new linkage from EBAY and be done with it. Anyone experience this? I have the impression in my case a whole linkage replacement would do the trick as even with wiper play reduced, the wipers can't make it across the windshield without a little help of some washer fluid ! How do I see your pictures? The post was made several years ago by an inactive user, so you won't get a direct reply from them. From taking a look at the post, it doesn't look like the picture was ever attached by the user. Good info though! Maybe time for a "STICKY" alert?? Rather than using the Dorman 49447 bushing assortment, I used the Dorman 49449 which has two identical bushings in the package. The advantage to the Dorman 49449 is that it doesn't need any trimming. This bushing has a groove in which the wiper linkage arm snaps into. 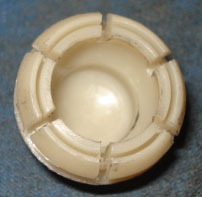 And this part is molded differently than the 49447 bushings. The difference is that the six beveled sections that hold the bushing onto the linkage arm are separate from the cup section that holds the bushing onto the linkage ball. 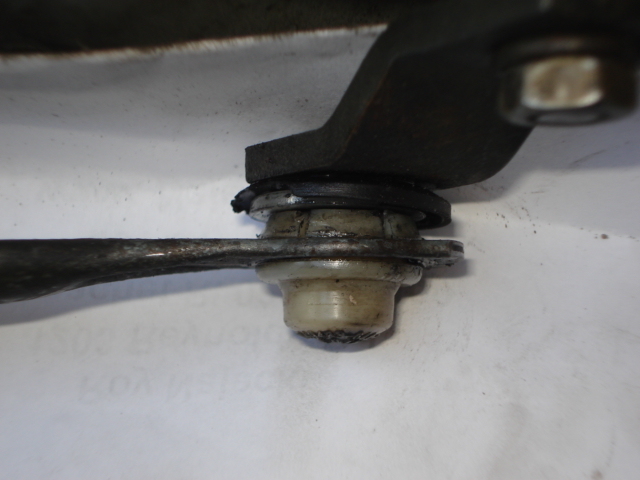 I removed the whole linkage from the car and made the repair on a workbench, but you might be able to replace the one bushing near the wiper motor, which seems to be the one that often fails, with the linkage still on the car. If you try that first, you don't have to remove the black plastic cowling on the drivers side firewall either. Just remove the cowling on the passenger side, and the snap-in cover that hides where this bushing attaches to the wiper linkage ball. I did find it helpful to heat the bushing in hot water, and a small flat bladed screwdriver was needed to press down two of the beveled sections so it snapped into the linkage arm. Thanks to everyone in this thread - just repaired mine as well. One item to note: the clerks at O'Reilly weren't immediately able to find the part in their system - because it was under supplier "MTM", not "DOR" for Dorman. Apparently MTM is the division of Dorman, and they have it filed under that. Just repaired mine yesterday using part number 49449. After cursing and swearing trying to get the bushing through the linkage arm I ended up accidently breaking two of the bevelled lugs off. Still a nice firm fit though so I left it in place but time will tell if this will significantly weaken its hold and lead to failure. I used the 49449 and it was a breeze. I removed the linkage and wiper shafts. Cleaned the one at the motor as it was the only bad one after 210000 miles on my 2001 Subaru Forester. I used an 18 mm 12 point socket to place the open end against the linkage. 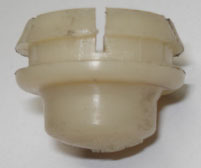 I placed the Dorman 49449 (For Nissan Cars) bushing into a 15mm 12 point socket with the cap end in first allowing the flange to rest against the edge of the socket. I started the bushing in the linkage and place the 18mm socket, linkage, bushing, 15mm socket into a vise and slowly pressed the bushing into place. Perfect and easy with only light finger pressure on the vise. No heat required and it was 40 degrees Fahrenheit in my garage. Removed it from the vise and inspected that it was a firm fit with nothing broken. I placed some water resistant grease (marine) into the bushing and reinstalled the linkage, shafts and all. Simple as that. Thanks to everyone for the information in diagnosing the wiper slap, over travel, and general looseness. Thanks to those that posted how to remove the linkage.